With many years’ experience as a property developer, Henry Kennaugh on the Isle of Man both understands the importance of quality and is not afraid of innovation. When Henry was asked to rectify work on a substantial private house following the collapse of the previous builder’s business, his challenge was to not only repair poor work that had already been done, but to deliver an extremely high-quality finished solution for the home owner. 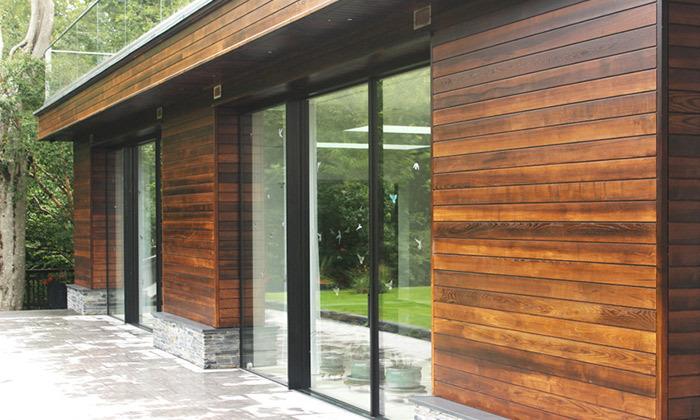 The project, which lasted a year and cost around £2million, involved stripping a 6,000 square feet swimming pool / spa extension of the property back to its steel frame, as the poorly installed tropical timber cladding had no blockwork behind it, only stud partition. This task required the installation of correct walls before re-cladding. 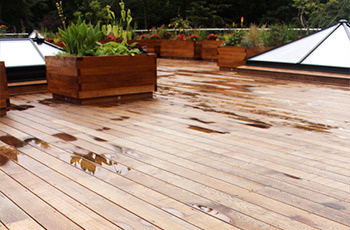 The roof of this extension was to include a roof garden that required decking. Henry had previously visited Timber Expo 2016 where he first encountered Brimstone thermally modified timber on the Vastern Timber stand, and he was impressed enough to realise it would be the perfect material for this high value project. "Decking using typical timber can often ‘dish’, but the Brimstone decking has proved very stable. It has stayed rigid, hasn’t moved and no joints have opened. 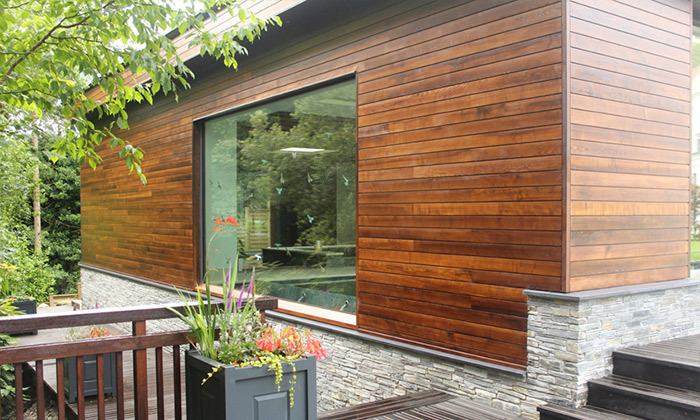 Plus, the cladding has weathered very well since installation." Vastern Timber supplied 6,000m of Brimstone ash for this project, including decking (VDEC2), cladding (VTG5a), and corner and soffit mouldings. 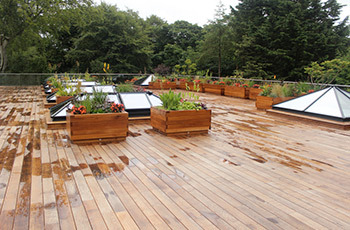 Such was the scope of the project that the decking alone took 10 weeks to install. To ensure the best results, Henry Kennaugh installed a tent over the project to ensure dry conditions for installation.